shore are 70 km long. 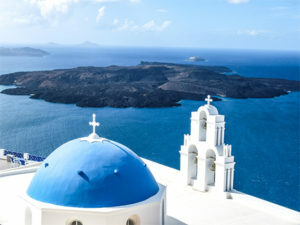 The length of Santorini reaches 18 km. Its width varies from 2 to 6 km. Fira is centrally placed at 10km away from the Port of Athinios. It is built amphitheatrically hanging from the cliff, offering a direct view to the volcano and probably the best view you have ever seen. Try to find accommodation with volcano-view since it is definitely worth it to wake up in the morning and see such a view. The village of Fira has expanded due to the tourism explosion of the island and along with Firostefani and Imerovigli form a large village on top of the cliff, offering lots of places to stay, drink, eat and enjoy the view. You can stroll around the alleys at the edge of the cliff, shop at the numerous traditional and modern shops, or do some serious clubbing in the various bars and clubs. 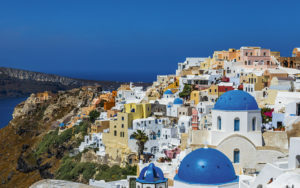 In order to appreciate the more quite side of Fira you can walk around the small churches, monasteries (Orthodox and Catholic) and the Archaeological Museum. Oia village is not over 10km from Fira. The small houses, carved into the rock, the mansions with their stairways and their neoclassical architecture, with white and ochra as their dominant colors, the walls decorated with small stones, the roads paved with flagstones, and the flowers, form a harmonious total of the impressive picture of the Oia village. The Oia village square is a balcony looking at the caldera. The view of the volcano and the infinity of the sea take a different dimension when seen from here. The wealth of the villagers of the last century is exhibited in the Nautical museum of Oia. Oia’s inhabitants were sailors, and became rich in the last century by working in the sea. They decorated their village with neoclassical buildings which today bear witness to an age that has passed. Once the Oia had been officially listed as a protected traditional community, some sixty derelict houses, abandoned in the wake of the 1956 earthquake, were repaired and converted into hotels and rented rooms. Visitors looking for atmosphere and peace and quiet come to Oia, where they can find some of the most beautiful hotels on the island, perfectly integrated in the landscape. And when you have had enough of shopping you will dine to the sound of classical music and, before you return to your room or hotel, take a last stroll through the island’s most enchanted village. The cinemascope- like sunset comes to an end and the violet colors of night embrace Firostefani. 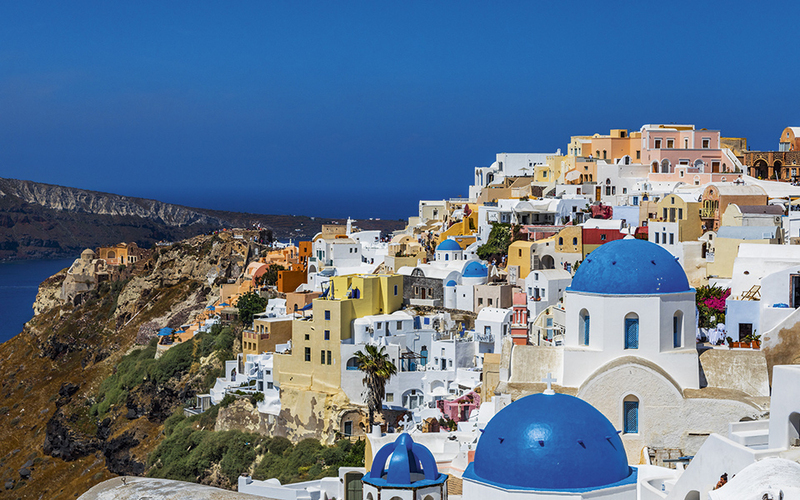 It is an ideally central area outside of center , a link between Fira and Imerovigli. Altough these three settlements have more or less joined together, each one still manages to preserve its own identity. The prople who choose to stay in Firostefani, are those who love the hustle and bustle of Fira, but also want relaxing holiday. Firostefani provides integrated accommodation solution to cover all tastes and budgets. A unique atmosphere: verandes hanging over the caldera, luxurios semi under ground apartments, swimming pools on the edge of cliffs. Imerovigli is an ideal “balcony ” to the Caldera, and that explain the fact that it has developed into a “hotel-village” of postcard beauty. Couples in love actually create this village’s profile. Romance, view and peace. Fira is only five minutes away by car and 20 minutes on foot using the path along Caldera that passes trough Firostefani. Anyway, the evening hours are the best for walk up to Skaros, the lonely rock that rises up from the sea right in front of Imerovigli. It is here that the Venetians had built their most important fortified settlement. Kamari beach it’s a summer resort in Santorini. So if you are looking for Summer resort then Kamari beach is the place for you. The black sandy beach, at least two kilometres in length, is the main attraction of Kamari. On the beachfront you will find hotels, restaurants, bars, discos and shops to please all tastes and budgets. The town is connected with frequent bus service from Fira. Kamari speaks perfect English, German and Swedish and has never abandoned its Northern European habits. Also interesting in Kamari is the church of Panaghia Episkopi which was built in 1100. The best time to visit the church is on August 15th during the feast of the Virgin Mary when the church celebrates with a large festival. You are invited to join in on the marry making with plenty of food, dancing and singing taking place. If you are around on September 24th the church Panaghia Myrtidiotissa celebrates with festival where again the tourists are invited dine and wine with the inhabitants. The oldest signs of human settlement are Late Neolithic (4th millennium BC or earlier), but ca2000–1650 BC Akrotiri developed into one of the Aegean’s major Bronze Age ports, with recovered objects that had come not just from Crete but also from Anatolia, Cyprus, Syria and Egypt, from the Dodecanese and the Greek mainland. Pipes with running water and water closets found on Thera are the oldest such utilities discovered. The pipes run in twin systems, indicating that the Therans used both hot and cold water supplies. The hot water’s origin was probably geothermic, given the volcano’s proximity. In Pyrgos you come face to face with medieval Santorini. The village still preserves the structure and characteristics of the fortified Venetian town, surmounted by its castle. Pyrgos was one of five fortified towns built by the Venetians in th 15th century. Climbing from the square up to the castle walls (cars are not allowed within the village), the stone houses crowd more densely together and the labyrinth of narrow vaulted lanes becomes more tortuos. But once you come out to the top, the fabulous panoramic view of the island will take your brath away. And if you happen to be there in the late afternoon, be sure to stay to watch the sun go down – you”ll never see anything like it again. Messaria has two faces : on the one hand , there is the busy cross-roads with the hotels, the main petrol station and the constant bustle, and on the other there is the traditional rock village, with noble mansions lining the main square and the abandoned Markezinis knitting-mill, a memorial to the time when Messaria was the industrial center of the island. Today it is lively village, with a fairly large permanent population. The newer section, built on on the edge of “the old town” is the bussines and commercial area: printer’s, craft industries, hair dreser’s, beauty parlour, shops, hotels, tavernas. Messaria is prefered by those who like to stay in central location, whether they choose the comfort and of an ordinary hotel with none of special features of Caldera or simply a rental room. Fira is not far away and as for the beaches…all roads lead from Messaria: Monolithos, Akrotiri, Perissa, and Kamari all lie at its feet. Megalohori is a rock village (dug into the bed of torrent) in the interior of the island that is known to have existed since at least of the 17th century. A small place (its name means “big village” but that appears to be more eupphemism), but a lively community with a fairly large permanent population. Megalohori attracts a fair number of tourist, who choose it as a handy base for exploring theisland: it is not to far from Fira (9 km), and within easy distance of both Akrotiri and the beaches of the Southeastern coast. Emborio is built on a plane, and for many years was (as the name indicates) the island’s commercial centre , the marketplace, for all its local produce. Today it is one of the island biggest villages, with the largest permanent population (many of seasonal businesses in Perisa are run by people from Emborio), several shops, a medical centre, a newagent’s and a school. Perissa is effectively a village that “opens” in October, with lots of tavernas, few good hotels and pleny of rooms to let. It is also the location of the best campground on the island , whose beach bar is the scene of the liveliest beach parties and happenings. Young faces everywhere, endless hours lazing on the fine black sand, beach parties, fun and games on the water slides. For young people whose idea of a good holiday is “the sea, lounge chair and umbrella five minutes from my bed, and endless bar -hopping on the black sand, this place is absolute paradise. Perissa is the longest beach on the island and it is separeted from Kamari by the rocky mass of Messa Vouno. Wet black pebbles, deep cold water, jet ski races, beach volley tournaments…Perisa and Perivolas are growing into one another, as hotels and rental units continue to built between them. Perivolas is the place for those who want to be right on the sea, but do not want the night life and the noise of neighbouring Perissa. Accommodations ranges from luxury hotels to simple rented rooms.Perivolas is synonymous with water sports, good food and fun on the beach, making a day here a must for visitors to the island. Messa Gonia was one of the island’s major wine producing centres. The 1956′ quake levelled what was once a prosperous farming village, and its inhabitants moved down ti Kamari. Today, an idea of its former glory can be gleaned from visit to the Roussos and Argyros wineries. It is only very recently that the first houses have begunto repaired. Tourist usually pas right trough the village and go straight on to the only “sight” in this area, the church of the Panagia Episkopi, the most important Byzantine monument on the island. Built in the 11th century by Emperor Alexios I comnenus, it has an ornately carved screen ( a rare example of using stone and mastic together) and fine wall paintings. In tiny Exo Gonia you are in another world entirely, with nothing to remind you that you are actually on the most tourist island in the Aegean. In the evening people gather in the courtyards of the houses, grannies sit gossiping on the stoops, friendly dogs rub against your legs. If a quiet evening is what you want Exo Gonia, built on slope behind Pyrgos, is right place. Drop in to the taverna foe supper, and enjoy the wiev towards the sea and the flat land where airport lies. 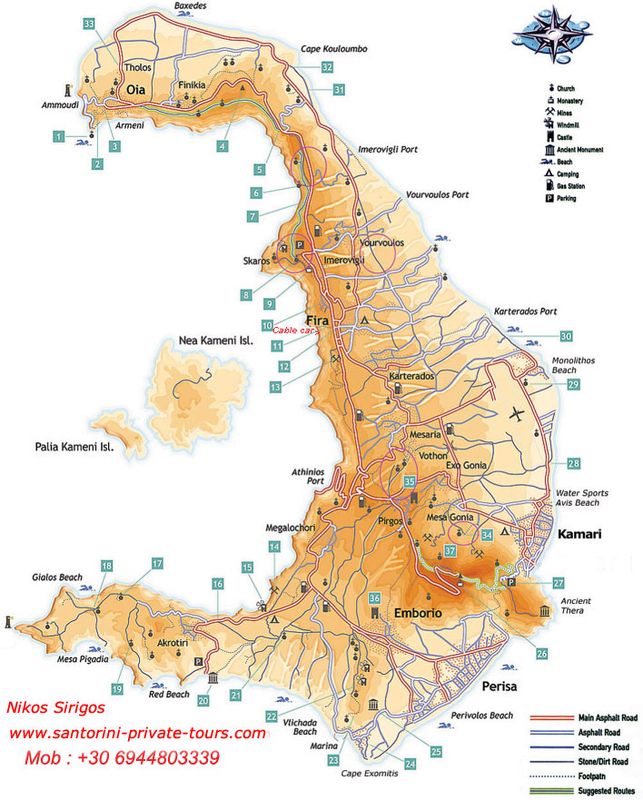 You can either come down from Pyrgos or snake up the sandy road to Kamari, which continues to Perissa. Salmon and green domes roofing the houses. Embroidered curtains fluttering in their windows. Cactuses peering over the walls and the shadow of a palm tree playing on the ochre-tinted walls of the Panagia Matrona. Once you have passed through the dark stone gateway (yes, the village has a main gate), there spread before you is a brightly coloured scene reminiscent of Morocco. Finikia is a small, well-preserved rock village just outside la which, when la was a prosperous shipping town, housed the farmers who cultivated the plain. Back then, it was almost an insult, in fact, to be called a “Finikian”. Today’s villagers still work their fields on the plain, but they also include wine-makers and people in the tourist business; in addition, a number of architects who appreciate the style and sim-plicity of the place have bought houses here. The few small hotels and rooming houses are clustered around the main road. You pass through Vourvoulos on your way to or from the beaches north of la. The village is not particularly interesting from the architectural point of view, nor does it have any special features or sights. The road that comes down from Imerovigli (there is also a way up from la) is paved with stone and quite steep, – a car can travel through -but the view is well worth the trouble. Vourvoulos is not on the tourist map, and you will probably not see anyone but the local farmers who actually live there and the few foreigners who have built houses in the village. The single hotel and few rooms to let will attract those who want real isolation and easy access to the beaches north of la. The classic example of a rock village. As the coastal villagers did with the Caldera, so the people of the interior dug their houses into rocky walls of a ravine five kilometres long. The soft volcanic soil was easy to work, and proved to be an excellent building material. Indeed, the domed roofs they cast and then sealed with a mortar of lime and volcanic rock can stand alone, without requiring a support structure of rafters. A stroll down the main street of the village (which is simply the bed of the ravine) leaves you in awe of the wisdom and ingenuity of those village craftsmen, who knew how to build strong houses with the cheapest of materials and how to exploit the depth of the gully to pro-tect them from the winds. Architecturally, this is the strangest village on the island, and is worth a visit just for that reason. Your first impression of Monolithos is domi-nated by the solitary rocky outcrop, which gives this coast its name, and the soaring smokestack of the tomato paste plant (the only one still in operation on the island). With its broad beach of fine black sand and seemingly endless shallows, Monolithos has inevitably developed into a family resort. Small children can splash happily in the shallow water and play with their buckets and spades in the sand. When they’re tired, the hotel is right there, and so are the taver-nas. Monolithos is organised around these three focal points: hotel, beach, restaurant. Karterados is just a small inland village, with children playing in the cobbled streets and a few hotels and rooms to let for those who are looking for cheaper accommodation within easy distance of Fira. The older part of the village is all but invisible from the main street. The rock houses have been dug out of the bed of a torrent, and their roofs are on a level with the pavement. The main road is all hotels, shops and tavernas.